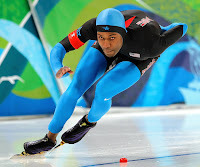 Shani Davis, left, became the first African-American to win an individual gold medal at the 2006 Winter Olympics in Turin, Italy. He repeated the Olympic gold medal win in the 1,000 meter race last night with a time of 1 minute 8.94 seconds. Davis is from Chicago, Illinois.